Analysis Supermicro's latest Samsung ruler-based thin storage server can cough up 10 million IOPS, has a 20GB/sec throughput and 576TB capacity, which is all very well, but its Intel ruler one can provide 13 million IOPS, 52GB/sec and a whole petabyte. The new Sammy ruler-based product, the SSG-1029P-NMR36L, has 36 x 18TB NF1 format hot-swap drives in its 1U chassis providing 576TB of capacity. This has updated an earlier 288TB model announced in January. Samsung hasn't yet announced this drive but did say a 512Gbit chip version of the PM983 was coming in the second half of 2018. This must be it. We covered Sammy's PM983 NF1 SSD in June, saying it measured 11cm x 3.05cm, compared to M.2's 11cm x 2.2cm. Originally called NGSFF (next-generation small form factor), it stored 8TB using 256Gbit TLC V-NAND (3D NAND) chips. That would appear to have risen to 16TB as Supermicro said its system has 36 NF1 SSDs to get to its 576TB capacity. 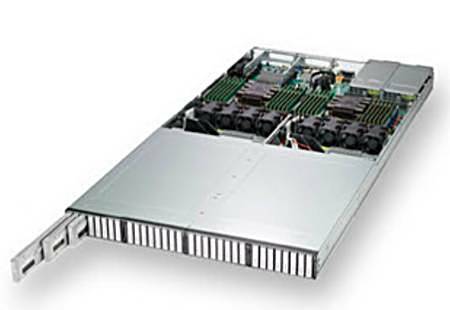 Oddly Supermicro also referred to a spec sheet that stated the system has 32 NF1 drive bays and four SATA 3 M.2 drive bays – which would give the NF1 a capacity of 18TB. It's presumably out of date, but we've queried this with the vendor. Supermicro's box has two Xeon SP processors (up to 205W and 56 cores), up to 3TB of memory and dual 16-lane PCIe network cards. Last month Supermicro announced its 1PB-in-1U system using 32 Intel EDSFF (enterprise and datacenter SSD form factor) ruler SSDs, with NVMe interfaces. Its product designation is SSG-136R-NR32JBF, which means a JBOF (just a bunch of flash drives) and it can have up to eight directly connected host servers accessing it. Supermicro's president and CEO Charles Liang said at the time: "This ... supports a full petabyte of high-performance all-flash storage in a single 1U system, outperforming any previous system available with an outstanding 13 million IOPS and 52GB/s throughput in 1U." That's with the directly connected hosts, ostensibly outperforming the Samsung Supermicro system. But it's not a fair comparison, as the Sammy box is a single server rather than eight of them sharing a JBOF. Meanwhile, the Intel D5-P4326 EDSFF drive stores 32TB, using QLC 64-layer 3D-NAND in a long and thin enclosure – about 30.5cm long by 4cm wide by 1cm deep (12 inches long, 1.5 inches wide and 0.33 inches thick). You simply can't fit 32 of these in a 1U chassis and have enough space left over for two Xeon SP processors, 3TB of memory, fans, power supplies, network cards and so forth. That's why it's a JBOF.